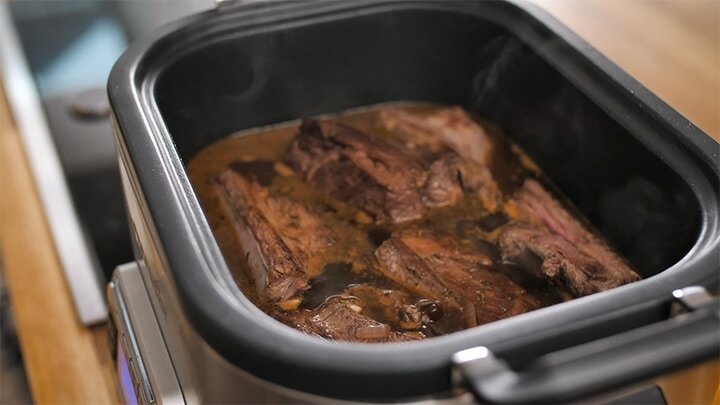 Fall-apart beef served with a rich and meaty red wine gravy. This is serious comfort food. 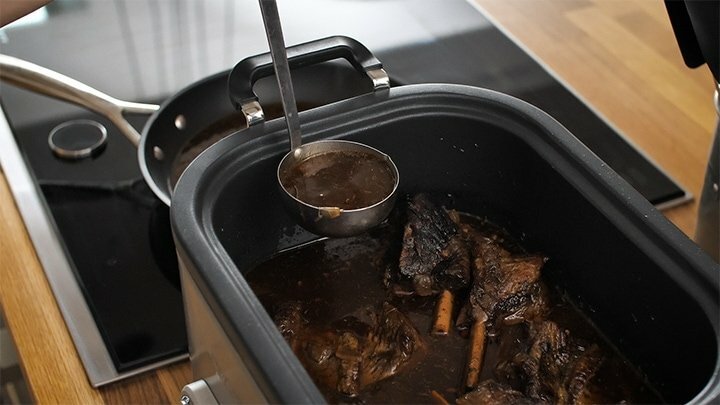 The whole family devours my Crockpot Beef Short Ribs with Rich Gravy! Oh man, I love these beef short ribs! So tasty served on a big pile of creamy mashed potato and smothered in gravy. One of the things I love about short ribs is the sheer amount of meat you get on them. These ones from the supermarket are pretty meaty (easily enough for the kids to share one), although if I go to the butchers, they’re sometimes huuuuggge! Last time they were so big, one short rib fed all four of us! Of course I saved the leftovers and we had a giant burrito feast the next day. Bring the liquid to the boil, then turn down the heat to a simmer. Stir in a little cornstarch slurry to thicken, then turn off the heat. 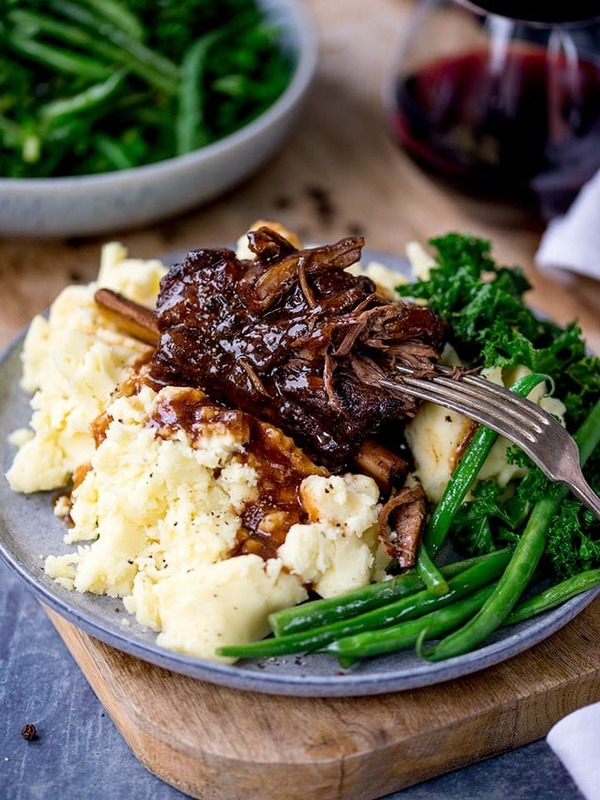 Serve the short ribs on top of creamy mashed potato with green veg and a good drizzle of that gravy. Let’s just have a close-up look at that meat again……. Let’s talk mashed potato. One of my childhood dream-foods – I’ve always loved mashed potato. It’s got to be proper mash though. By that I mean laced with lots of butter, a good drizzle of thick cream and some freshly ground salt and pepper. Done like that, I just want to sit on the sofa and eat it straight from the pan. An absolute must for me is a potato ricer. Have you tried one? I have a thing against traditional mashers – they just don’t work for me. I always end up with lumpy mash. Potato ricers may just be one of my favourite kitchen inventions. 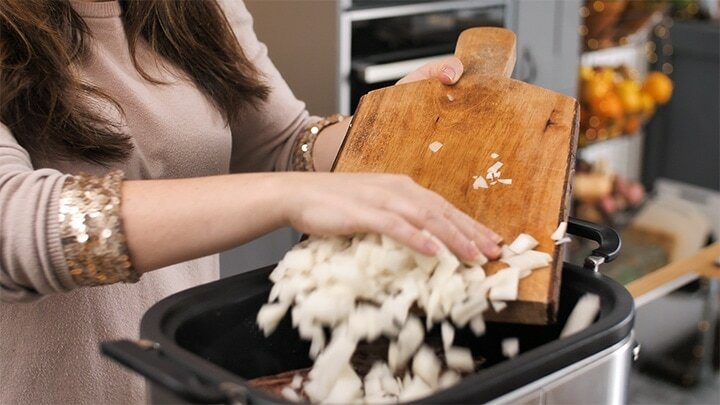 I use this OXO good grips one. 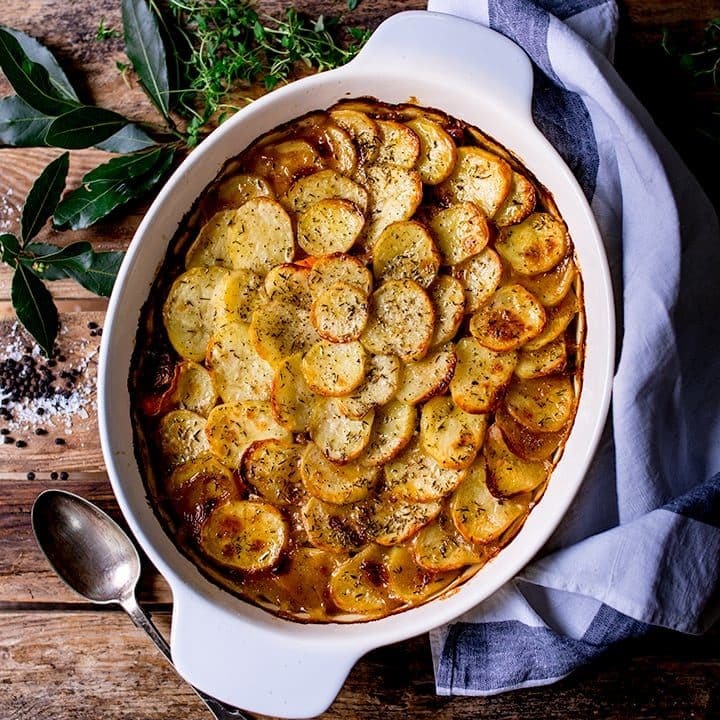 No peeling needed, no need to work up a sweat, endlessly bashing those potatoes. For emergency mash (I’m not the only person to have ever used the words ’emergency mash’ am I?) you can even shove a whole potato in the microwave to cook and then put it through the ricer. Any leftover mash and veg is fantastic fried up into bubble and squeak patties. 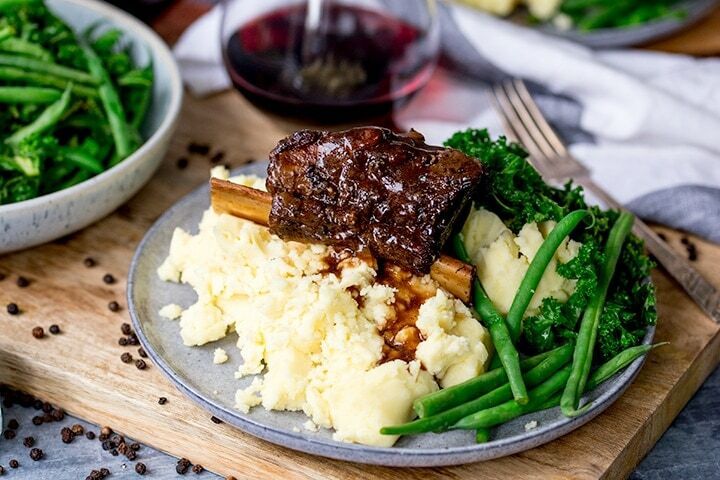 The mash for this meal is served with a deliciously meaty red-wine gravy – meaning it’s pretty unlikely you’ll have any leftovers anyway. 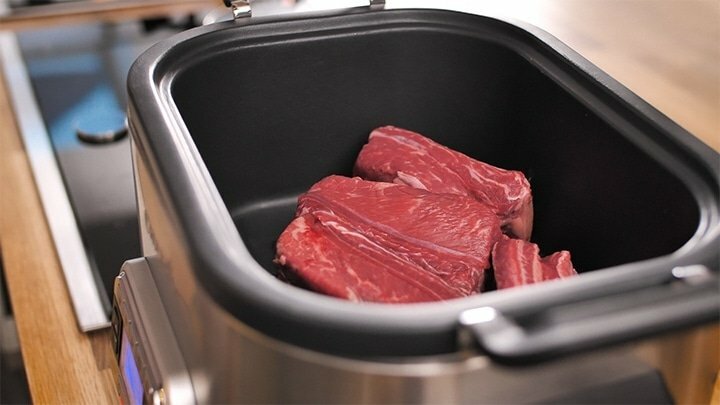 A Fying Pan/Skillet if you cant cook directly on the hob with your slow cooker insert. A good Kitchen knife. I bought this one recently and LOVE it! Wooden or Silicon Coated Spoons. We have just bought these and love them! Can I make it in the oven? 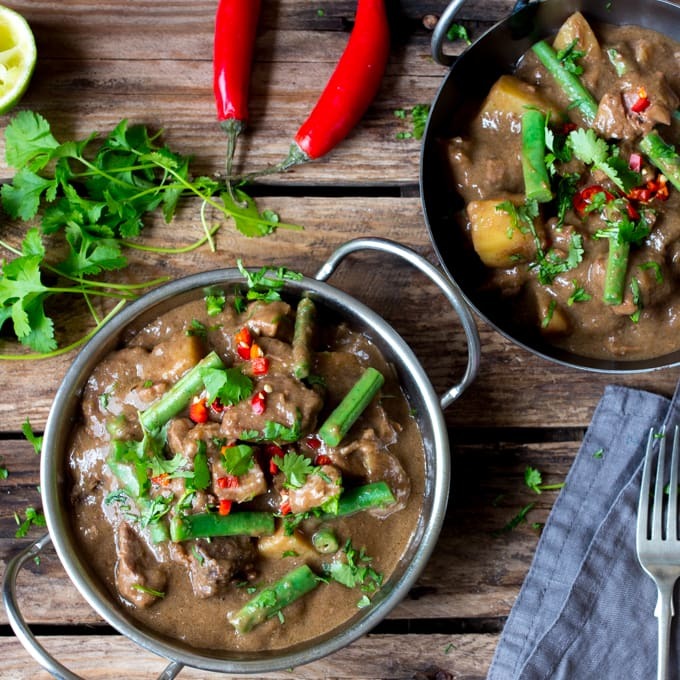 Yes – cook in a dutch oven or heavy-based pan with a lid at 140C/275F for 3-4 hours. Check every half hour or so in the last couple of hours of cooking and top up with more stock if needed. It will need to have at least a couple of cups (480ml) of cooking liquid left at the end to make the gravy. Yes. Once cooked, cool quickly in the cooking liquid (do this before making the gravy), then cover and refrigerate Reheat in a pan (with the cooking liquid) with a lid in the oven at 160C/320F for 30-40 minutes, until piping hot throughout. Reheating in the liquid will help keep the meat moist. You may need to add a little more stock to ensure you have enough to make gravy once the meat has heated through. Yes. Leftovers can be cooled quickly with any leftover gravy, covered and frozen. Defrost overnight in the refrigerator, then reheat in a pan with a lid in the oven at 160C/320F for 30-40 minutes, until piping hot throughout. You may need to add a splash of hot water or stock so the gravy doesn’t dry out. Yes, this recipe is already gluten free if you use gluten free stock. Also check your red wine brand and tomato puree/paste is gluten free. Simply replace with the same amount of stock plus an extra tablespoon of Worcestershire sauce (or 1 tbsp balsamic vinegar). Fantastic burritos (I heat up the shredded meat and gravy in a pan with little chilli sauce). You could also make meaty sandwiches like this brisket sandwich with garlic potatoes (I know it’s not brisket, but it will work just as well). 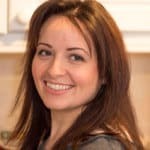 Alternatively heat up the shredded meat and gravy in a pan with a tablespoon of tomato paste, a tin of chopped tomatoes and a half teaspoon of chilli flakes to make a quick ragu, then stir it through cooked pasta and top with parmesan. 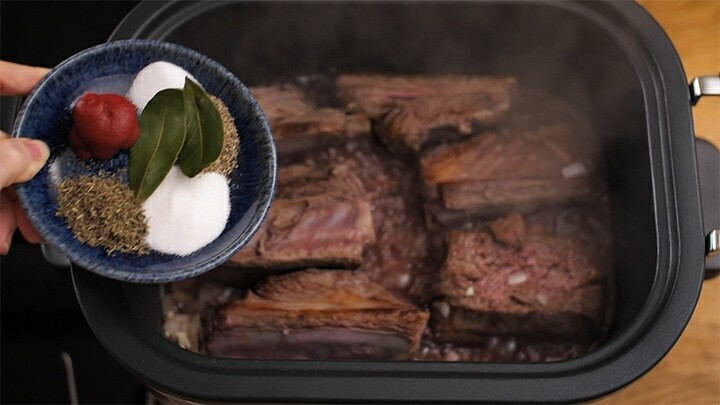 Crockpot Short Ribs. Fall-apart beef served with a rich and meaty red wine gravy. This is serious comfort food. Heat the oil on high in a large frying pan (or the bowl of your crockpot if it’s flame-proof like mine - check it out here). 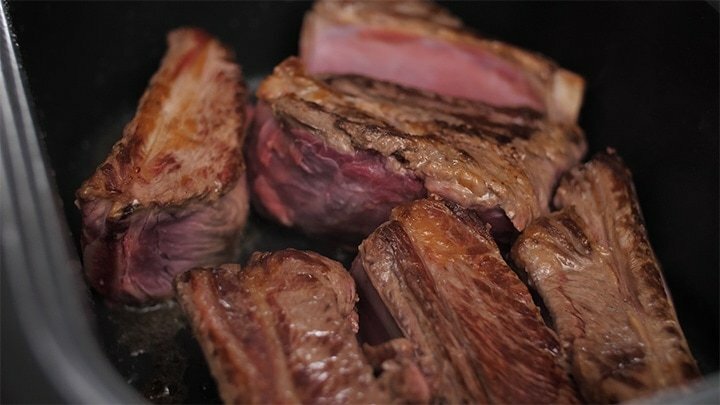 Place the short ribs in the pan and brown on all sides. This should take about 10 minutes. Add in the onion and cook for a further 2 minutes, whilst stirring. Add in the garlic and heat through for a minute, then add in the red wine. Bring to a bubble and allow to simmer for 3 or 4 minutes, then add in the rest of the short rib ingredients. Bring to the boil, then transfer to the crockpot. Place the lid on and cook on low for 6-8 hours. Once the ribs are nearly ready, make your mashed potato and cook the green veg. 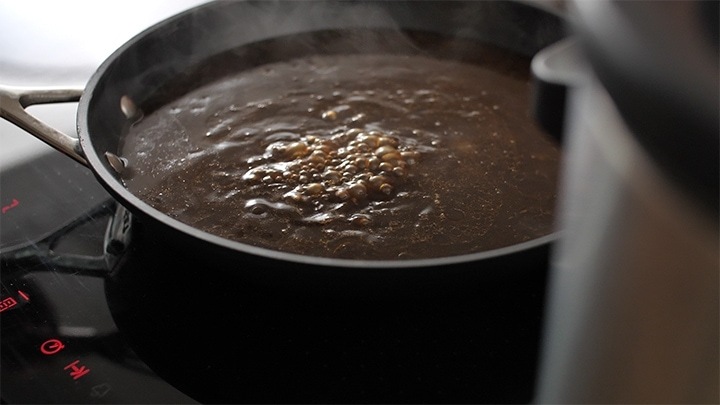 To make the gravy, ladle most of the cooking liquid out of the slow cooker and into a saucepan. Heat on a high heat. Mix the cornstarch and water, then slowly pour the mixture into the cooking liquid whilst whisking - until the gravy thickens. You may not need all of the cornstarch. You’re looking for a nice gravy of a medium-thick consistency. 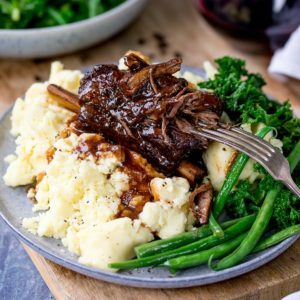 Turn off the slow cooker and place one short rib on top of a pile of the mash. Pour over a little gravy, and repeat with the other 3 short ribs. Serve with the green veg and more of the gravy. Yes - cook in a dutch oven or heavy-based pan with a lid at 140C/275F for 3-4 hours. Check every half hour or so in the last couple of hours of cooking and top up with more stock if needed. It will need to have at least a couple of cups (480ml) of cooking liquid left at the end to make the gravy. Yes. 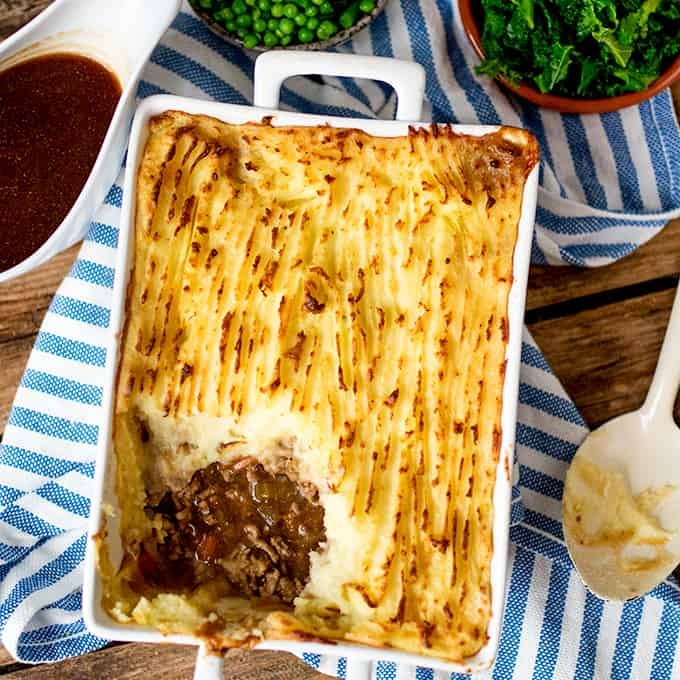 Leftovers can be cooled quickly with any leftover gravy, covered and frozen. Defrost overnight in the refrigerator, then reheat in a pan with a lid in the oven at 160C/320F for 30-40 minutes, until piping hot throughout. You may need to add a splash of hot water or stock so the gravy doesn't dry out. You could also make meaty sandwiches like this brisket sandwich with garlic potatoes (I know it's not brisket, but it will work just as well). Nutrition info is for one serving of this recipe and does not include the serving suggestion of mashed potatoes and green veg. This post was first published in May 2015. Updated in December 2018 with new photos, video and tips. These were phenomenal! I left out the red wine since I didn’t feel like going to the liquor store. I’m not a big fan of thyme so I was unsure about the recipe, but these are the best short ribs I’ve ever made! Next time I would use just a smidge less thyme maybe, but absolutely loved these. I used boneless since that was all the grocery store had in stock. This is a delicious and easy to make recipe. Everyone goes for seconds every time I make. This is my go to meal when company is coming and I don’t have too much time to cook. 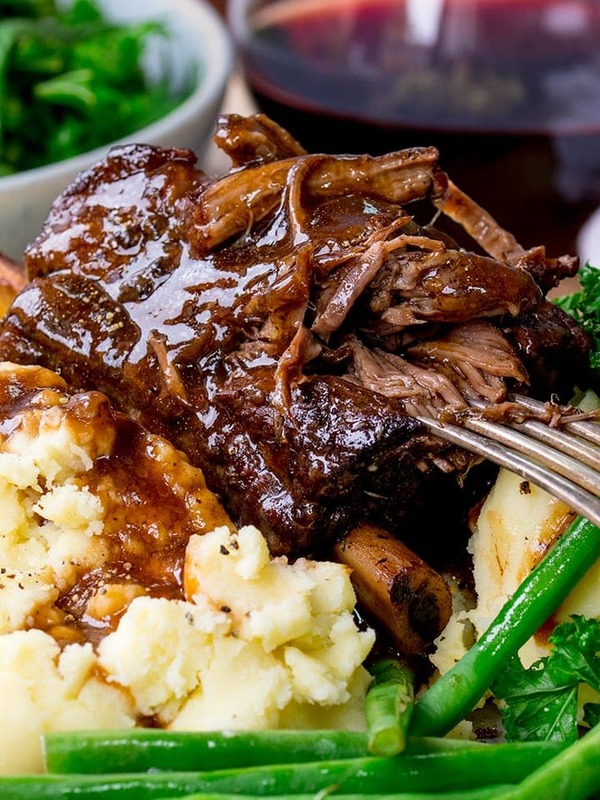 Love this recipe for short ribs!! I’ll will make it over and over again!! You could try it without the wine and substitute in an extra cup of beef stock and a tablespoon of balsamic vinegar (to give a little touch of acidity). If you do try it let me know as i havnt tried removing the red wine myself. My youngest sons request for next family meal get together, I totally agree with his choice. 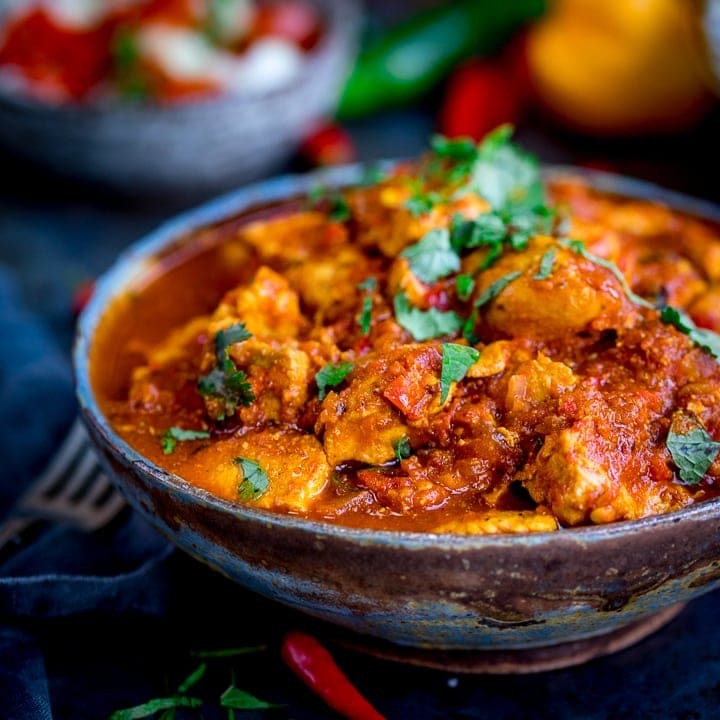 This recipe is Amazing!! I put it together last night and left it in the fridge. Took it out this morning and let it come to room temperature and cooked it on low for 7 hours. What a fantastic dinner to come home to on a cold Tuesday night after a long day at work. A def do over!! Thanks for posting. I’ve had a touch of bad luck with too much liquid in the finished dish and I don’t want Short Rib “soup”. Is there trouble cutting back on the water? I definitely want to use the red wine however. Can I cook them longer than 8 hours? I won’t be home from work in time and the crockpot will switch to stay warm for a few hours before I can get home. I used a chuck roast instead of ribs for more meat and less $$$. Short ribs are pretty expensive. Tasted GREAT. My husband went back for seconds. I also made risotto with mushrooms instead of potatoes this time. The sauce is great. I’ll certainly keep this recipe handy. Just made these tonight and they were super tasty!! I subbed in some veggie and chicken broth since I didn’t have beef on hand. Really amazing. Thank you!! Made this tonight as a “first time recipe” to break in my new slow cooker.. I used a little over 3 lbs of short ribs, and sadly didn’t have any stock so I just used water, but the recipe was super easy and turned out really deliciously! I add more salt, wostershire and thyme. Then my secret wostershire pub burger seasoning. Can I substitute tomato paste for purée? I made it yesterday, it was wonderful. The smell in the house while this is cooking is incredible. Thank you for the recipe! Hi Maria, I’ve never tried it with white wine, but I’m not sure it would work. I think it would make the recipe a little bitter. If you had some beer/ale/Guinness, that would make a better alternative.